Dinosaur bone sterling silver inlay ring by Mark Hileman. 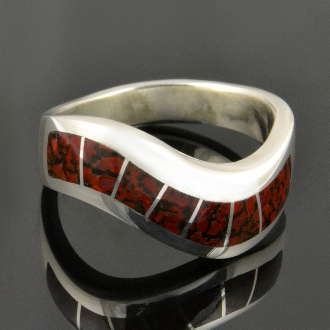 Seven pieces of red orange dinosaur bone are inlaid in this unique curved channel ladies ring design. The gem dinosaur bone inlay in this ring is reddish orange with black webbing or matrix. This Utah dinosaur gem bone came from the Colorado Plateau and is around 144 to 208 million years old. It is not actually dinosaur bone but is a combination of minerals that replaced the dinosaur bone material over time. Dinosaur bone is found in a rainbow of colors with the webbing color and cell size varying greatly from piece to piece. The gembone's varying cell size and color palette create some truly unique patterns and help us to make some very eye catching jewelry. The fossilized dinosaur bone can be composed of many different minerals including agate, jasper and calcite. The dinosaur bone color is determined by the combination of minerals present when the fossilized bone formed millions of years ago. Some colors are more rare than others with multicolor cells in a nice pattern being the most highly sought after among collectors. High quality dinosaur bone has a hardness of 6-7 on the Moh’s scale and takes a great polish for jewelry. This ring style measures about 7mm wide and is shown in a size 6. It may be special ordered in other sizes and inlay color combinations. Special order sizes and combinations will take 4 to 6 weeks to complete. The ring is stamped sterling silver and handsigned "MMH" by Mark McBride Hileman. This style ring also makes a nice alternative wedding band.